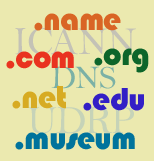 A salute to the few candles in the darkness, sites that are actually using the domain name system in at least some recognizable semblance of its original intended structure. A look at a few of the more outrageously incorrect uses of the domain name system that are rampant in the Internet world today. This page was first created 14 Mar 2001, and was last modified 24 Mar 2002.